Reluctant readers are the subject of many discussions by educators, writers, and parents and that’s not going to change anytime soon. We all want to know how to help someone find joy in reading. We believe reading will enrich a life, as it has enriched ours. We love reading and we want others to love it too. 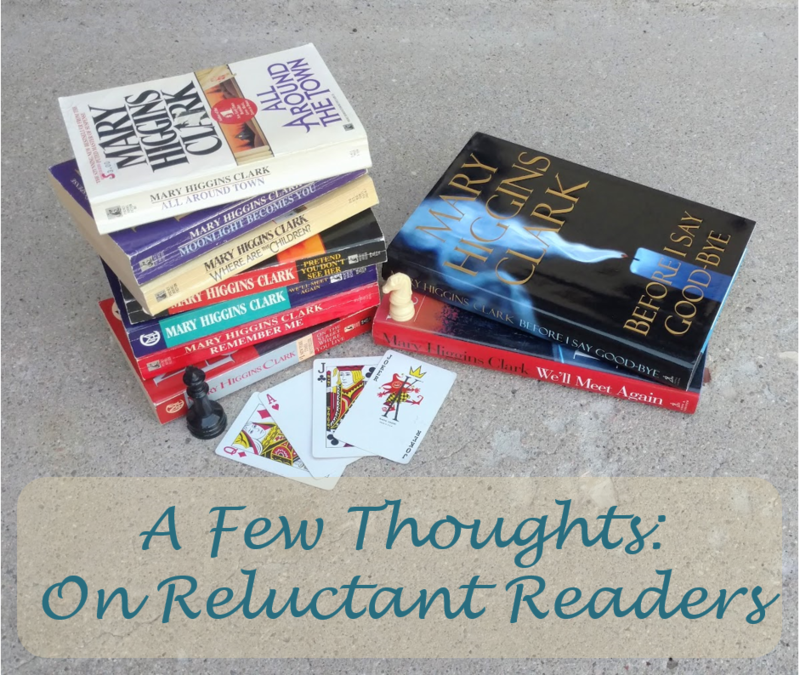 I don’t know that I have anything new to add to the discussion, except my own experience as a recovering reluctant reader. It seems unthinkable to me now—a parent, teacher, and storyteller—that there was a time when I didn’t do much reading. My mom says I stopped reading for fun around third grade and she had no idea why. I don’t know why either. I’ve thought of several possible reasons as I look back (did I discover it wasn’t cool or get frustrated when a book was too advanced for me? ), but I honestly don’t remember the actual reason. I was a junior in high school, driving home from a doctor’s appointment with my mom when she asked the question that changed things: What do you like to read? I told her I liked Harry Potter because there was no long exposition. You jumped right into the story and it had your attention right away. That’s when Mom suggested Mary Higgins Clark. I started with Where Are the Children and it definitely jumped right in and caught my attention, but it was All Around Town that hooked me. I read at least ten Mary Higgins Clark books that summer, which was a big number for someone who didn’t read for pleasure. The next summer, I read everything my parents handed me, including Dune and Rebecca. Here’s what I learned from this experience. First, it doesn’t have to be great literature. I guarantee that at that point, Dickens and Austen would not have worked for me. I needed to get back into the swing of reading, to remember what it felt like to get lost in a good book. For me, that meant reading something fairly easy, that caught my attention on the first page. Second, it’s all about what the person likes to read. As I’ve looked back, I wonder if some of my problem was that I wasn’t trying to read the right kinds of books for me. Most of what was available to me was realistic fiction. I wonder if there had been more fantasy options for young readers at the time (or in my house), if it would have been easier for me to come back to reading. It’s possible I was more of a fantasy and mystery reader as a kid and we simply didn’t know. Third, it doesn’t have to be a book. I got American Girl magazines in the mail as a youth and I read those cover to cover. Sometimes finding what the person loves to read is less about finding the right book and more about finding the right medium. If there’s a reluctant reader in your life, ask them what they like to read and do what you can to find something to fit their preferences (feel free to peruse our blog if you need suggestions). My name is Paige and I am a recovering reluctant reader.